Chelsea were knocked out of the Champions League as Barcelona showed their class in a 3-0 victory at the Nou Camp to win the last-16 tie 4-1 on aggregate. 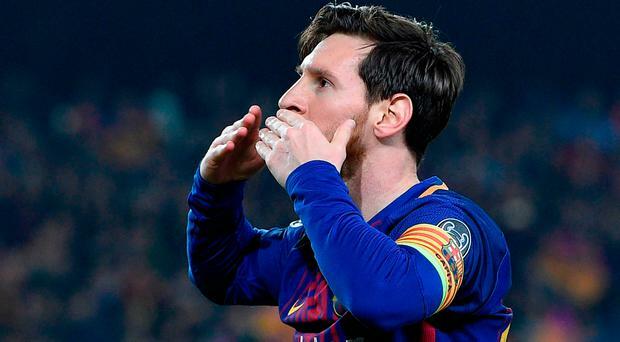 Lionel Messi netted his fastest ever goal after just two minutes and eight seconds to hand the Catalan giants the initiative, and his second-half strike brought up his century of goals in Europe. Ousmane Dembele also found the net between the Argentinian's strikes, consigning Antonio Conte's side to the same fate as Man United and Tottenham. It leaves Liverpool and Manchester City as the Premier League's only two representatives in the quarter-finals. Chelsea goalkeeper Thibaut Courtois said: "I don't think we deserve to be out, but individual mistakes cost us in both legs. "There were missed passes from us and they scored from our mistakes. We have to be honest about that."